You Are Here: Home » Opinions » Can women be head coaches of NFL teams? Can women be head coaches of NFL teams? 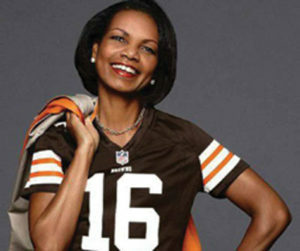 Recently, Condoleezza Rice was trending on social media when it was reported by NFL insider, Adam Schefter, that the Cleveland Browns were considering the former secretary of state for its most recent head coaching vacancy. Her love for the team stems from times when she and her father watched games together and cheered on Hall of Fame running back Jim Brown. The league, however, is making strides, as there are few teams that have opened their doors and are affording women the type of on-the-job-training required to be able to take that next step toward coaching in the NFL.